While most distributors are focused on maintaining lower inventory levels, The Lawless Group provides an important service by warehousing local inventory. Operating five warehouse facilities, The Lawless Group’s commitment to local inventory is evidenced by more than 200,000 square feet of warehouse space devoted to supporting the supply channel. Each of our principals has their own unique approach to local inventory and support. Our mission is to effectively implement these policies in support of the manufacturer’s marketing strategy. 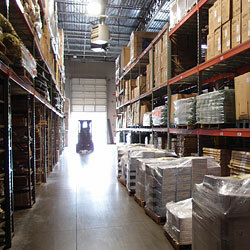 Warehousing is another example of The Lawless Group’s commitment to serving the needs of our trading partners. Dallas, TX – Houston, TX – Stafford, TX – Our inventory falls into two categories: 1) manufacturer-owned consigned goods that remain with the manufacturer until received by the purchasing distributor, and 2) goods owned by The Lawless Group that are subject to different terms and available through combined orders.